Extreme return with their first new record in thirteen years and they bring back the harmonies, stellar guitar parts and funky bass that had been their trademark back during their original run. It's entirely the same though, as before, they have this sound that was sometimes showed influences of both Queen and Van Halen. On the new album there is far more of Led Zeppelin influence popping up throughout. 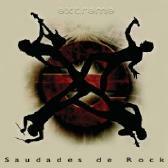 My first time through this left me feeling a little confused because "Saudades de Rock" sounds like Extreme did back in the day yet at the same time it doesn't. Huh? Well, all the features I mentioned at the start of this review were indeed present. Songs like "Star" and "Run," for example, are musically and vocally along the lines of what we might expect yet the overall feel is perhaps a little less bouncy and maybe even not as upbeat. In the end that's okay because it still works, just in a different manner. This album isn't exactly more involved than any of the previous Extreme albums, but the band does widen the field a little by attempting a broader range in how they approach most of the songs. That's not to say that every track works, but it's a good effort. Extreme really took a stab at not just a comeback, but they obviously wanted to show some growth as well. I can't help but shake the feeling that they seem a little reserved at times, but that could just be a case of trying to shake off the dust from not having recorded with one another in such a long time. Of course it wouldn't be an Extreme album without a few ballads and most of the ones here work rather well. This isn't an album that was easy to take to in just one listen, but it does grow on you and a few listens are in order. It's not exactly where Extreme was at their peak and it doesn't really pick up where they left off. Yet it gives a healthy serving of what most worked in their music years ago plus they certainly give us some new sounds to chew on as well. For more information, check out http://extreme-band.com. Nuno and the boys split this album into three parts based on the three sides of every story: “Yours” “Mine,” and “The Truth.” They rather cleverly weave their political views into some songs, while they don’t cram anything down your throat either. Once again, I listened intently to Nuno Bettencourt’s guitar playing. Although, I didn’t hear the fire I witnessed on “Pornograffiti,” I still heard some funky playing. This release seemed to be more constructed than previous releases; not controlled, but more compartmentalized and that was the band's purpose by dividing the album into three sections. “Yours” (songs 1-6), deal with political views. “Mine” (songs 7-11) has some romantic overtones. “The Truth” (songs 12-14) have some progressive offerings. Clocking in at seventy-six minutes, "III" is a lot of music to digest. I did get a little bored near the end because the mood changes from song to song in a strange way. The music is still good and taking a few minutes to listen closely will help you appreciate their direction. Gary Cherone really uses all his vocal ability on this disc. You can see why he was chosen to front Van Halen (albeit briefly). I find it odd that Nuno has said he always wanted to be Eddie Van Halen and then Gary got to sing with him. It’s funny how the music biz works. Since this disc didn’t have any Top 40 hits, you may not have heard most of the songs here so, if you haven’t heard this CD, consider this fresh music from Extreme. I do like the Martin Luther King Jr. speech in “Peacemaker Die.” It gives the song and the band's lyrics more depth. Extreme: Patrick Badger – bass guitar, vocals; Nuno Bettencourt – guitars, piano, keyboards, percussion, vocals; Gary Cherone – lead vocals; Paul Geary – drums, percussion, vocals. When I first heard Extreme, it was due to their exposure of the songs “Kid Ego” and “Mutha (Don’t Want To Go To School Today)” from their self-titled debut album. I thought the songs were a little juvenile back then. When Extreme gained a little more ground I sought to check them out because the song “More Than Words” was being slathered all over pop radio. I thought great, another acoustic lollipop. 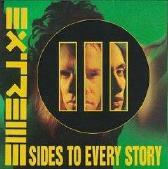 Extreme has a funky style of rock but the guitars are a mirror sound of Eddie Van Halen. Now enter Nuno Bettencourt’s style and you have a choice between two versions derived from Van Halen’s guitar playing. Now before anyone sends me a nasty e-mail saying Nuno couldn’t tune Eddie’s E-string, just listen to this release and tell me who he sounds like. Sounds like, mind you, not replaces. Now back to the review: Nuno has the skills to pay the bills and even though his guitar playing is coupled with horns it still commands the stage. I had a friend whose mother tossed this CD in the trash because of the title. I didn’t care about the title, just the guitar rippling from my headphones. Nuno played with a fire that I hadn’t heard or even wished I had heard since “More Than Words” was being played too much. I like Nuno’s style because he can play all types of music. A few songs are heavy metal; a few are radio-friendly (like the aforementioned song and “Hole Hearted”). There are also lounge offerings and ballads. You really can’t plug Nuno into one category and he may be all over the place on this record but the guitar just rips in spots and I’m one for a great gitfiddle attack. Gary Cherone has pipes that buoy Nuno’s playing and the rhythm backs up the whole band. Just listen the beginning of “He-Man Woman Hater” and tell me if Nuno wasn’t one of the best during his time. They do get a little political on a few tracks but I didn’t care about their message when Nuno was ripping out solos that sounded like leftover Eddie Van Halen outtakes. If you have this CD dust it off and relive the good ole days before Nuno went solo and Gary tried to kill (or save, your choice) Van Halen. Extreme: Gary Cherone, Nuno Bettencourt, Pat Badger and Paul Geary.